When I read articles on how to save money on groceries, I often find two types of advice. In the first camp: You just need to grow your own fabulous garden, can everything, bake your own bread and like, create entire meals with condiment packets when necessary. The second camp: Simply switch to a smaller sized latte everyday and eat less avocado toast for breakfast and you will SAVE BIG. I may be weird (or totally average), but I tend to fall in between these two camps. Making extreme commitments to saving money can be necessary at times, but it can also be overwhelming to try to completely change your spending (and cooking) habits all at once. Not all of us have the time or ability to grow a big garden or make absolutely everything from scratch, but we can start somewhere. I’ll admit that as our family has grown to include 6 people, saving money on groceries has become a bigger challenge! I have less time than ever before to look for deals or clip coupons – yet we need to save money now more than ever. And like most people when it comes to saving money, I find that it’s easier to gradually develop better habits by making small, realistic changes in in my spending and shopping habits. The small successes you have when you first start budgeting your money can give you some great momentum to work towards bigger savings goals. And it’s more likely that the habit will stick when you don’t go the “extreme” route all at once. Think of all the fad diets that have come and gone: the same rate of failure applies to budgeting when you “starve” yourself of things you enjoy OR try to change your habits overnight. These tips for saving money on groceries are five subtle and simple changes you can make, which can really add up to big savings over the course of a month. And it’s likely that you’ll hardly feel the pinch at all! 1. Use half as much meat at dinner time. Try this for just two meals per week and see if you notice the difference this month. This works especially well for casseroles or tacos where you can bulk up on other less expensive ingredients. For example, instead of using 1 pound of ground beef for your taco meat, brown the meat, save and freeze 1/2 pound for another meal later in the week. Let’s say a pound of ground beef costs $5/pound. By only using $2.50 in hamburger and substituting a $0.60 can of black beans, you’re saving $1.90 on just that meal alone. If you’re making a chicken/brocolli/rice casserole, for instance, add some extra rice and use 1/2 of the chicken the recipe calls for (dice and freeze the other half for later). By cutting out approximately $2 in meat twice a week, you should notice about a $16 savings this month in the meat department. 2. Download the Ibotta app. 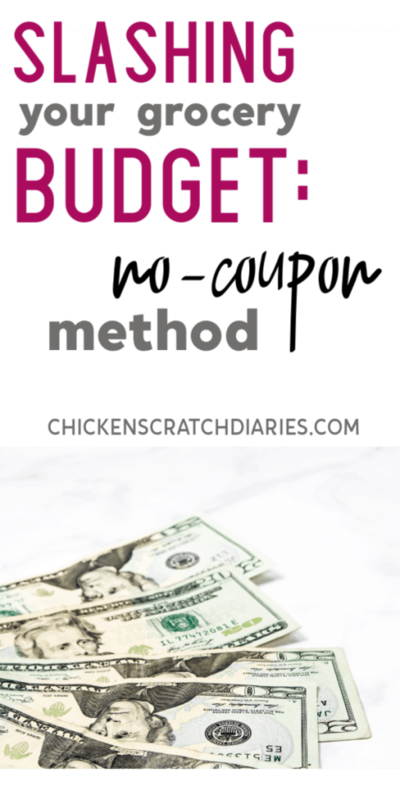 I could dedicate an entire post to all the money-saving apps out there that can save you money on groceries, but for this month let’s keep it simple and start with Ibotta if you’re not already using it. This is one of the most popular digital rebate apps for groceries in particular, because with over 300 retail chains at over 500,000 locations it’s likely you can use this app at your closest grocery stores no matter where you live. Dumpster diving for coupons never really appealed to me, so I was thrilled to jump on the Ibotta train. Simply download the app, look at the rebates available for products that you need and add them to your grocery list. Be sure to check the details- some rebates require a purchase of 2 of that item in order to receive a rebate, for example. Some offers can be redeemed multiple times which can really boost your savings, especially if you need to stock up on some pantry items! Scan your grocery receipt with your smartphone when you get home from the store, scan the item if prompted and your account will be credited the amount of the “coupon” within 48 hours. Once you reach $20, you can cash out your savings and the money is deposited directly into your PayPal account (or a gift card if you prefer). I was able to cash in my first $20 after using this app for only three weeks! Pretty awesome. Sign up for Ibotta through my referral link here and receive $10 just for redeeming your first rebate! 3. Learn to love water. A recent study shows that the average American drinks about eight 12-oz cans of soda per week. If you’re “average” in this respect, you’re probably spending at least $20 per month just on soft drinks for you and your spouse. And that’s only assuming you’re buying soda at the grocery store — you can at least triple this number if you’re both also stopping for a $1 soda at McD’s five times a week! If you buy orange juice, apple juice, or other sweet beverages, let’s estimate two containers of juice per week at $2.50 each, your monthly bill for these non-essential groceries could easy be costing you $40 per month combined. Personally, I don’t buy juice for my kids (I’m a mean mom) because it’s bad for their teeth and it adds a lot of unnecessary sugar to their diet. But I know a lot of kids enjoy a cup of juice a few times a week and that’s ok! But again, I’m not trying to convince you and your family to change these habits overnight. I hinted that these would be gradual changes, right? So my challenge to you is to cut back 1/2 of the amount of soda and juice you normally buy and replace it with water for the next month. You’ll save $20 this month and will probably feel a lot better too! 4. Order pantry essentials online OR try curbside pickup. I don’t know about you, but walking into the grocery store with my 4 kids and coming out with half of everything on my list while staying anywhere near what I budgeted is basically a Christmas miracle I haven’t witnessed yet. But can you REALLY save money grocery shopping online, I used to wonder? When I started ordering a few grocery items here and there online, I had no idea that it could actually save me money AND be a huge time-saver. First of all, if you don’t have a Target Red Card, you’re missing out. Target gives you 5% off plus free shipping on almost everything on their site so that’s a huge incentive for me alone. While you can’t get everything on your grocery list online, you can get a wide variety of breakfast foods, snack foods, pantry staples and other absolute essentials – like coffee – at great prices! Some of the perks I’ve found shopping online are: I can browse grocery items that aren’t available at my local store; I can take a few days to ponder what I really need versus want, and I can adjust my shopping cart to make sure I stick to my weekly budget. At Target, you don’t have to purchase bulk items (although you can if you want to), so it’s really just like shopping in the store – but waaay better in my book. If you have an Amazon Prime account, check out their Prime Pantry items. Basically, you search that category, add items to your cart and it tells you what percentage of your box is full until you get to 100%. If you choose at least 5 “qualifying items” in your box (typical grocery items you will want anyhow), you receive free shipping; otherwise, it’s $5.99 per box. They literally box it all up in one big box (rather than the several random boxes you might get on other Amazon orders with multiple items) and ship it to your doorstep. In addition to all this awesome convenience, Amazon has pantry coupons you can “clip” and the savings will be deducted from your total. I usually compare items I am needing between Target and Amazon and compare available coupons or discounts on each site. Before shopping at either Amazon or Target online, I always click through from BeFrugal’s website so that I earn cashback on top of all these discounts I mentioned above. If you do a lot of online shopping your cashback rewards will stack up very quickly. It’s such an easy way to boost your savings on stuff you have to buy anyhow! I recently started doing about half of my grocery shopping online and the first month, I saved about $40 in my grocery budget! Many stores including Target, Walmart, Sam’s Club, Kroger are starting to add curbside pickup. Check and see if your local store offers this service. You get the same savings benefits from shopping online: being able to see your cart total ahead of time and without distraction from kids, plus the added benefit of receiving your groceries the same day you order them. With curbside pickup, you can literally get ALL your grocery needs – perishable and nonperishable items in one order. And, you don’t have a hundred shipping boxes in your garage to deal with! Personally, I love this concept and can’t wait until it’s available in my area. If you’re a person who gets overwhelmed in the grocery store and/or makes impulse purchases because you just want to get the heck out of there, online shopping or curbside pickup might be your dream come true. The main thing to remember when shopping online (delivery or pickup) is to plan ahead. I keep a memo in my phone of any staples we run out of during the week and meal ideas so that when I’m ready to order groceries I know what we need – and what we don’t. 5. Swap eggs for meat once a week. In addition to just cutting back on meat (#1 above), we try to do a meatless meal once per week that is satisfying but budget-friendly. Some of our favorite ways to do this: Scrambled eggs or omelets with cheese and diced veggies; birds in a nest; or fried diced potatoes/onions/bell peppers/cheese with eggs mixed in at the end. Serve with toast and some apple slices! Our closest Aldi store frequently has eggs for $0.50/dozen so even if you used an entire dozen (we often do for six people), that’s much cheaper than any meat you’ll find. If you average $4 savings per week at 4 times per month, you will save $16 per month with this swap. By the way: I highly recommend shopping at Aldi in general to get the most bang for your buck on groceries. Our nearest Aldi store is 50 miles away so I don’t get to go nearly as often as I’d like to (hence the hunt for online deals). But if there’s one in your area, check it out! You can see how small changes can add up big — these 5 things could easily save you around $120 this month alone. If you want to make your savings stretch even further, I highly recommend banking what you save in a Capital One 360 online savings, checking or money market account (all have great interest rates). I’ve had an account for several years at this online bank and it’s been a lifesaver for us. There are no fees, no minimums, and you can set up automatic deposits to build your savings each month without even thinking about it. You can create multiple “accounts” within your main account and label them with your specific savings goals (“Christmas Savings”, “Vacation”, etc) – then easily transfer funds back and forth from your brick-and-mortar bank account. It’s really a no brainer! Sign up for your savings account here. What other simple and creative ways do you save money on groceries? Tell us below! This is an excellent post! 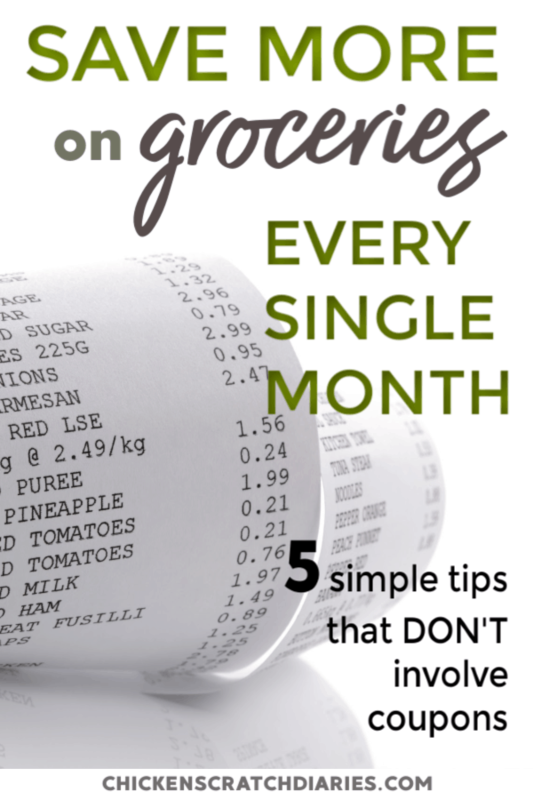 I am always looking for ways to save on groceries, and it is an almost impossible task! 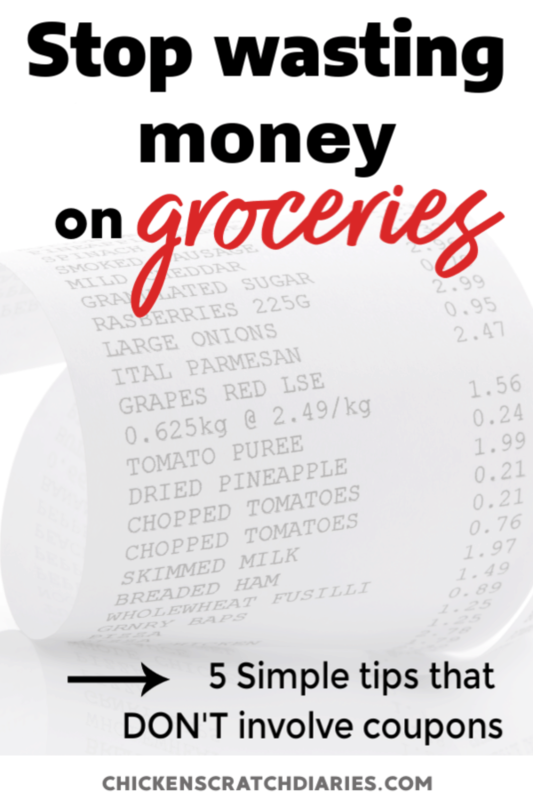 Groceries are the area in my budget that seems the most logical to cut when trying to save money, since it isn’t a “fixed” expense, but it is a chore to figure out how to do it isn’t it? Some months we do better than others. Thanks for the feedback Kristin!